“What I really like to do is obtain documentation from government offices,” said no one ever. Multiple steps, long queues, and an entire working day wasted–it’s an ordeal that practically every adult in the Philippines has had to go through in order to secure documents like a birth certificate, SSS ID, NBI Clearance, passport, driver’s license, PRC ID, etc. But with more and more government agencies going online, the days of waking up at 4:30AM so one could be the first in the queue may soon be over. 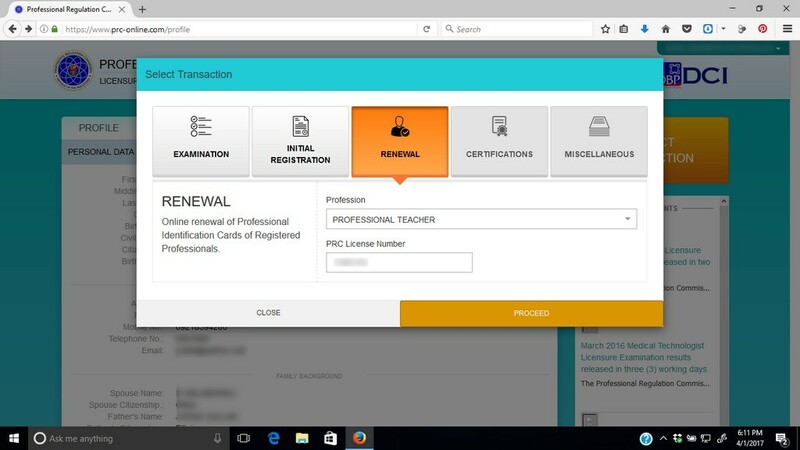 When the Professional Regulations Commission (PRC) announced the full implementation of the Continuing Professional Development (CPD) requirements for PRC ID renewal starting July 2017 (the very same month my PRC ID was expiring), I wasted no time in applying for a renewal of my Professional Teacher’s PRC ID online ahead of schedule. 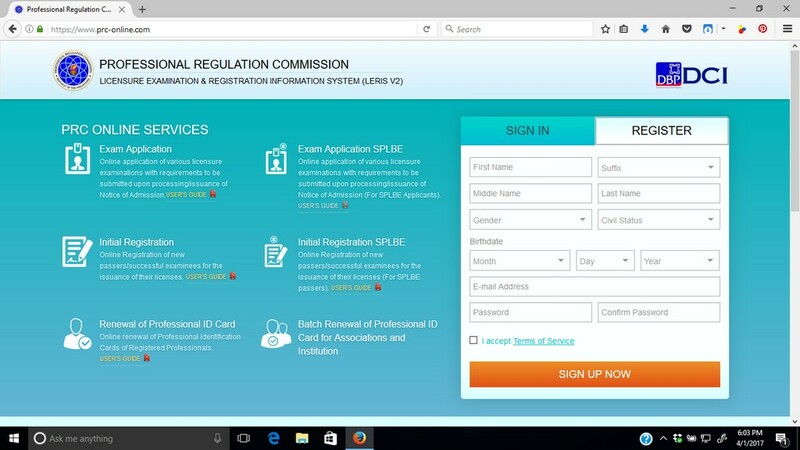 The first step was to register at the PRC LERIS (Licensure, Examination and Registration Information System) portal. PRC provides an easy-to-follow users’ guide for online PRC renewal here. Once registered, I filled in my personal details for my profile and uploaded a photo. By now, you must be familiar with the photo ID requirements (white background, tight shot of the face, person must be wearing a shirt with a collar, etc.). Next, I clicked on Transaction and selected Renewal. Then, I was asked to select my Profession and supply my PRC License Number. As soon as I clicked Proceed, the database instantly verified my current PRC Registration! Next, I set my appointment by selecting my preferred PRC Regional Office (Robinsons Place Manila), date (April 4th) and time (AM or PM, I chose PM). Afterwards, I had to select a payment option. 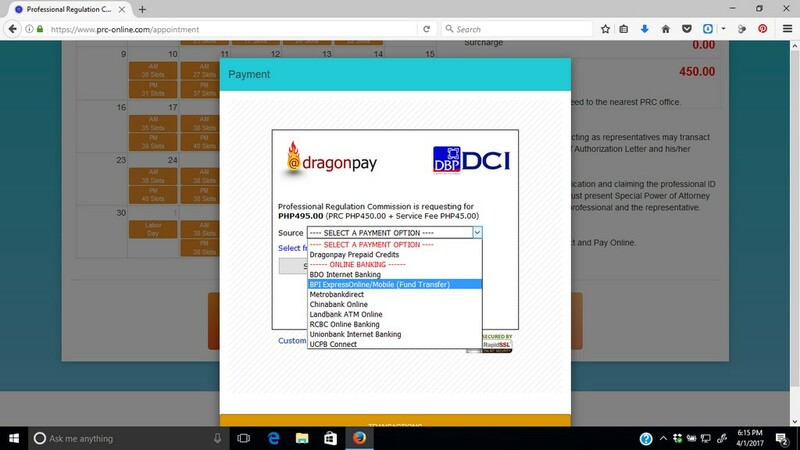 All payments are processed by online payment gateway DragonPay, but funds must come from either online banking or over-the-counter deposits (or DragonPay Prepaid Credits, if you happen to have them). My invoice came up to P545 (P450 renewal fee + service fees). I tried to pay online; first, with BDO and then with BPI, but both routes failed for some reason (I kept getting an error message and asked to try again and again…). Finally, I sucked it up and fell in line at the nearest BDO branch to make an over-the-counter deposit. This was the only queue I’d had to wait in. 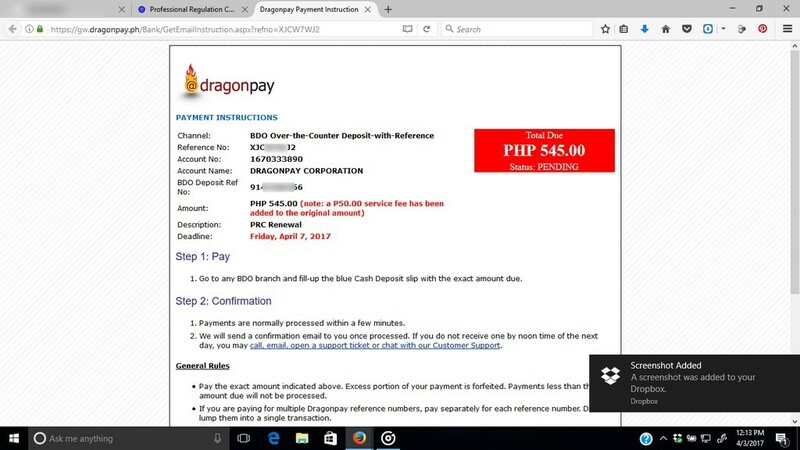 The system had promised that my payment would be verified by DragonPay within minutes of making the over-the-counter deposit, but when my status was still showing as “Pending” by nightfall, I contacted DragonPay’s customer service to have the matter sorted out. About two hours after I filed my support ticket, my payment was verified. I printed my claim stub and took a screenshot of my payment details for good measure. 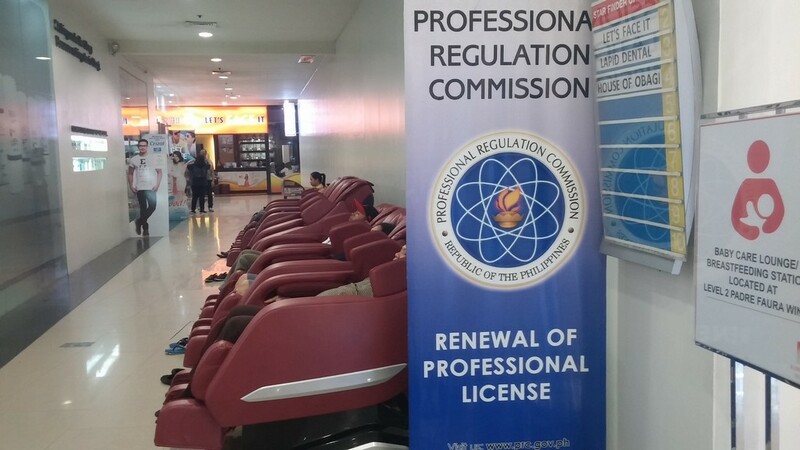 On the day of my appointment, I proceeded to the PRC Renewal Office on the 2nd Floor of Robinson’s Place Manila. I was pleased to see only about three people waiting inside. I went straight to the receiving window and presented my claim stub to the friendly lady sitting behind it. She asked for my old PRC ID and advised me to wait for my name to be called. I had barely warmed my seat when the lady called me back to the window. She handed me my new PRC ID, then she had me sign my name, as acknowledgment that I’d collected my new PRC ID, electronically using a Wacom tablet. It didn’t take more than 10 minutes from the time I walked into the PRC Renewal Office up to the time I stepped out. Ten minutes for a PRC ID renewal! A far cry from the six hours I wasted at when I attempted to renew my PRC ID at the PRC Office on Nicanor Reyes in 2014. I say “wasted” and “attempted” because I stormed out of the PRC compound while waiting for the line to the cashier to move, unable to bear the torture any longer. I ended up applying for a renewal at the SM Harrison Plaza business center. But that’s a story for another day. New Year, new you. Just like last year. wow so same day din po makukuha ung license kahit po sa mga mall? bukod po sa receipts nung payment ano pa yung need dalhin and my forms pa po ba kailangan ifill up?thank you. is it applicable po to all regional office like iloilo? 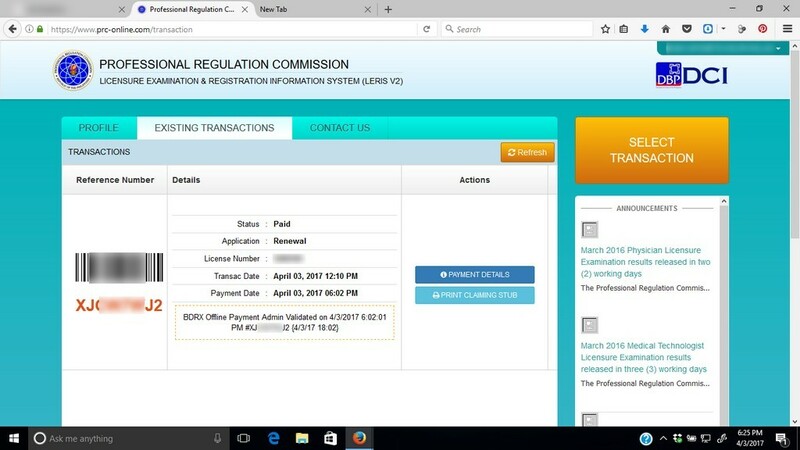 If the Iloilo regional office is showing up among the options in the online PRC ID renewal process, then it should be good to go. Otherwise, no. Hello po, kailangan pa po ba ng special power of attorney kung ipapaclaim nalang po sa relatives or pwede na po yung authorization letter nalang? 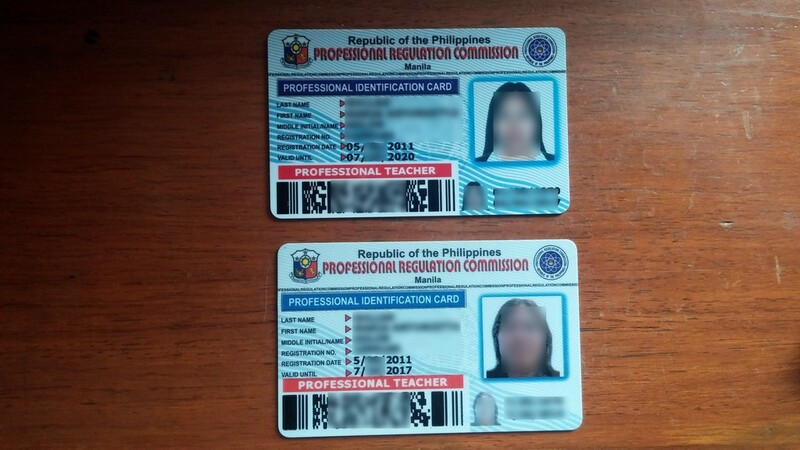 Kase PRC licensed din po yung kukuha. NASA ibang bansa po kase ako. Thank you! Authorization letter lang at ID mo, pwede na siguro. Hi! Bakit po Morning yung lumalabas dun sa transaction schedule kht PM po yung piliin ko na schedule for claiming the ID. Had this problem now. May I know what happened? Or is it possible to go in the afternoon though the stub indicates morning. Thanks! Hello po, ask ko lang po aside po ba sa ID renewal pwede rin po ba sa Robinsons Place Manila (Ermita) ang Exam application? Thank youuu! I’m sorry but I don’t know the answer to this. Ang alam ko pwede kung less than 1 year before the date of expiry. update lan po, naka renew po ako ala naman hiningi less than 10 mins lang sa robs manila po. thanks! Ask ko lng po, kung nagbayad ba sa bayad center ilang days mo maverify. Baka hindi na siya pwede. Mag-apply ka na lang ulit siguro. what time po ang open ng satellite sa robinson manila? sabay po ba sa opening ng mall? Opo, kasabay ng pag-open ng mall. I’ve heard of some people successfully applying for renewal by walking in to the PRC service kiosk, without prior online appointment. But I really don’t know the answer for sure. 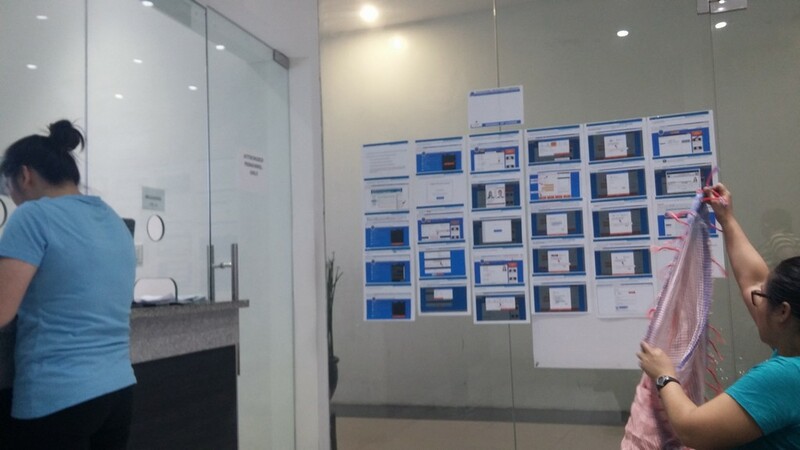 hi, just wanna ask if you tried to renew your license through kiosk and if it successfully went through? I wouldn’t call it a kiosk. It was a proper PRC satellite office. bakit wala pong lumalabas na schedule date… puno na po ba ang lahat ng slot itong november 2017;;??? 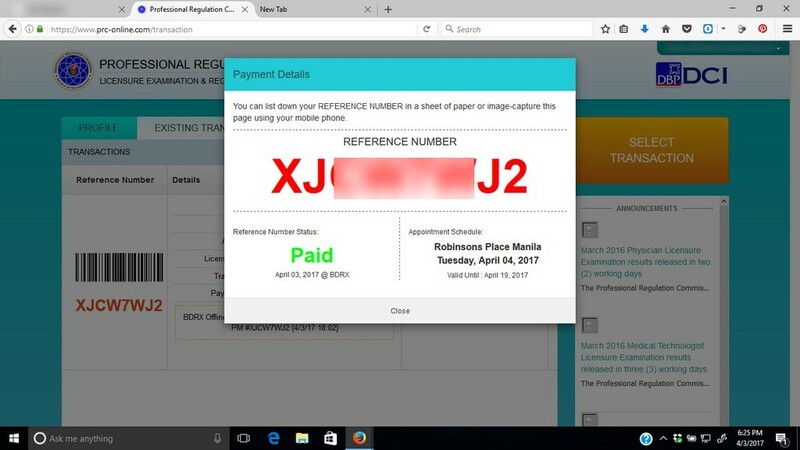 Kagabi lang po ako nagregister online. Nakareceive po ba kayo ng email verification? Di po kasi ako nakareceive. Then i tried to schedule for renewal kaso i’m unable to click the dates (di po color yellow yung boxes and walang am/pm). May idea po ba kayo kung anong problema? Thank you! nakapag register na po ako pero wala po nag appear sa mga dates kung available o hindi.. pwede po kaya mag walk in na lang sa robinsons ortigas? 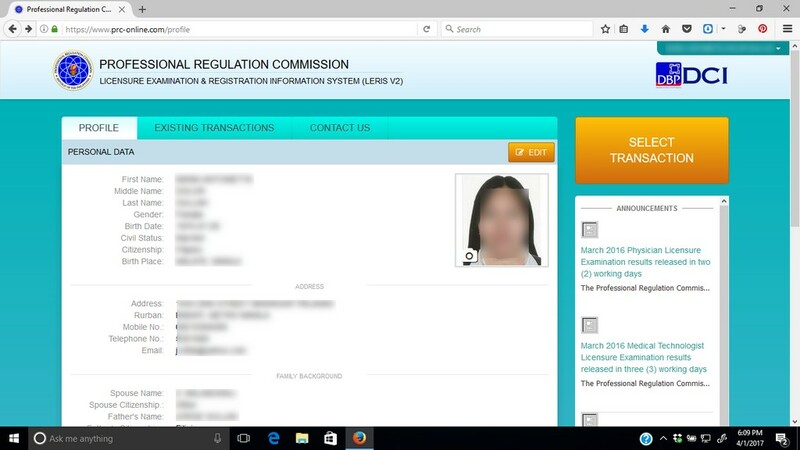 Good day admin na kompleto ko na po ang pag register up to Selection ng preferred PRC Regional Office. Kaya lang sa DATE na ng pagpipilian ko ng schedule ay ALL WHITE na does it mean puno na ang SLOT? Kaso lahat ng Regional Offices at lahat ng date hindi ma click. Please help po. Thank you! Hi. Paano po kaya kpg LOST ID then for RENEWAL dn. Same day dn po kaya yun? Bka po may idea kayo sa requirements. At hndi po ako makapili ng date, may problem po ata sa google chrome. Kpg click ko hndi na-hihilight. Hi po!di po ako makapagpaschedule sa online.wala pong nalabas na a.m/p.m po dun sa calendar.bakit po kaya? hello po! good day. bakit po walang nalabas na appointments?? after pumili ng branch. nag try po ako n kahit anong branch wala po tlga nalabas, may problem po ba pag ganun? thank you po! hi ask ko lang po bkit po di ako makpagpaschedule online.. after ilagay ng profession at license no. pag nagproceed po lalabas is request denied? walang schedule date po nakalagay kahit sa 2018, wala pa din. pano po to? 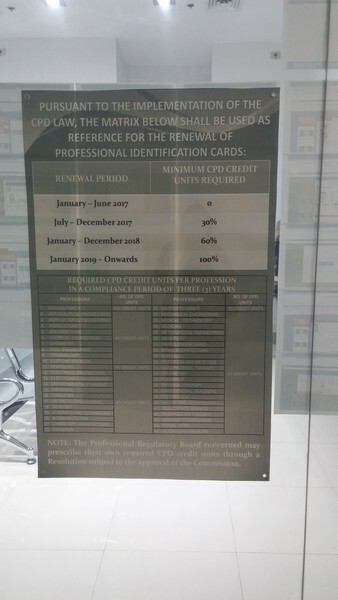 Hi po,,,tanung ko lang po ngaun day po kasi ako nagschedule for PRC renew tapos ngaun lang din po ako nagbayad,,,nakapagbayad na ko sa bayad center pero pending pa din po sya,,pwede po kaya na pumunta ako sa Robinson manila dalhin ko po yung resibo sa bayad center at dun na mag renew? Nag Set po ako ng appointment last December 13, 2017 dito po sa PRC Mobile sa PROVINCE.. Kaso po, hindi ko po napuntahan due to an emergency, Pero po.. NAKABAYAD na po ako For that Specific Transaction.. Ngayon po, Mag seset po sana ako ng Appointment on January 16,2018 sa PRC Baguio. Kaso Po pending po yung request ko dahil kailangan po ulit mag Bayad.. yung Application Form po na hawak ko ay may nakalagay na APPOINTMENT date: DECEMBER 13, 2017 Ano po ang gagawin ko.? Kailangan ko po ba ulit magBayad para po mag Approve yung Appointment ko? Nahihirapan po ako makalog in sa prc,ngayon.nag eerror po pag,na click ko ang page nila…. Hi po tanong ko lang po nag renew po ako tapos hinanapan po ako ng certificates. Hindi ako nadala so sabi next renewal 70 units na. Pwedi po ba ako mag renew ulit kasi meron man ako mga certificates 3 yrs back. Pero na renew na may id na po ako. I have the same prob. It says email helpdesk for verification, but there is no reply from helpdesk. How to proceed now? your site higher authority & rank in google. Hi gud am I used Land Bank ePP Merchant Facility for my initial registration as Environmental Planner and paid it with my GCAsh, and 1080.00 pesos was successfully deducted to my GCash. 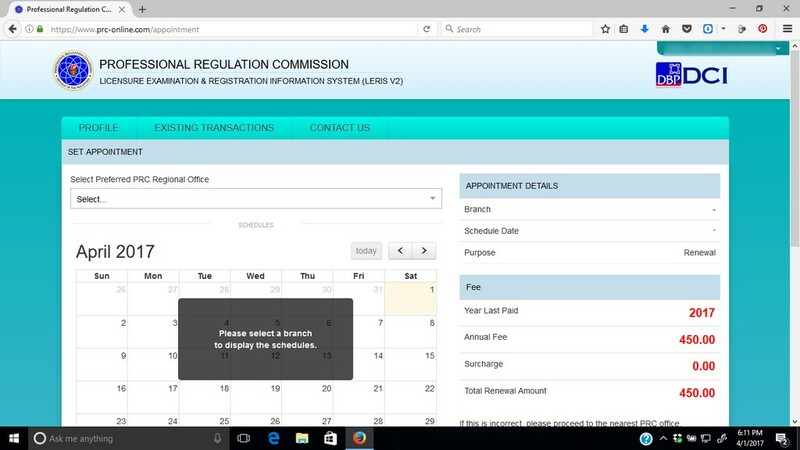 When I opened my transaction the status is pending, wala pa bang facility for Iloilo City PRC Regional Office. dpo aq maka proceed pagka tapos mag uplod ng pic pumunta aq sa renewal tapos click ko ung proceed ang lumalabas email prc-helpdesk@gmail.com for further verification pano po? help naman — same problem as mine!!! May problema po yata ang system. 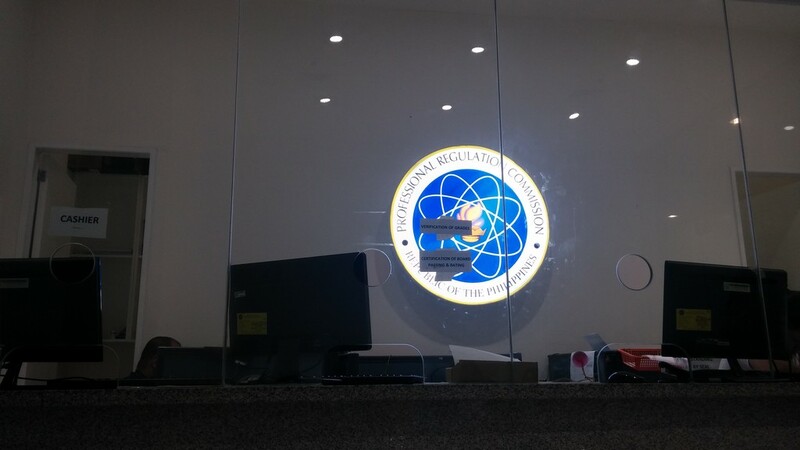 Pwede naman pong pumunta personallys a PRC satellite offices kung kailangang kailangan na po. Nagkakaproblema din po yung iba. Kung kailangang kailangan pwede naman pong pumunta sa PRC satellite offices. Hello po ask ko lang po pwde ba magbayad sa araw mismo ng appointment ng pagkuha ng prc id??? good day po prc kaylan ba matapos ang inyong maintenance para maka renew na po ako ng aking license? 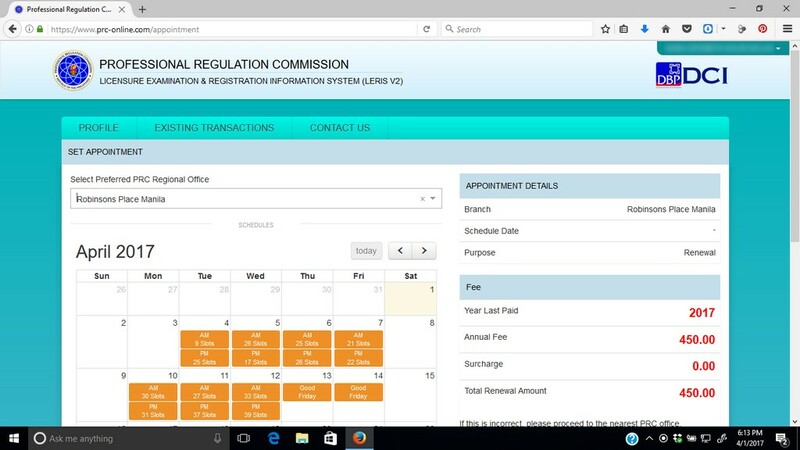 good day po prc.pwede po prsonal nalang po kami pupunta sa office ninyo kasi yung website nyo under maintenance? under maintenance po ang website nyo, mg eexpire n po license ko, ano po gagawin nmin, pwde n po bang mag walk in?